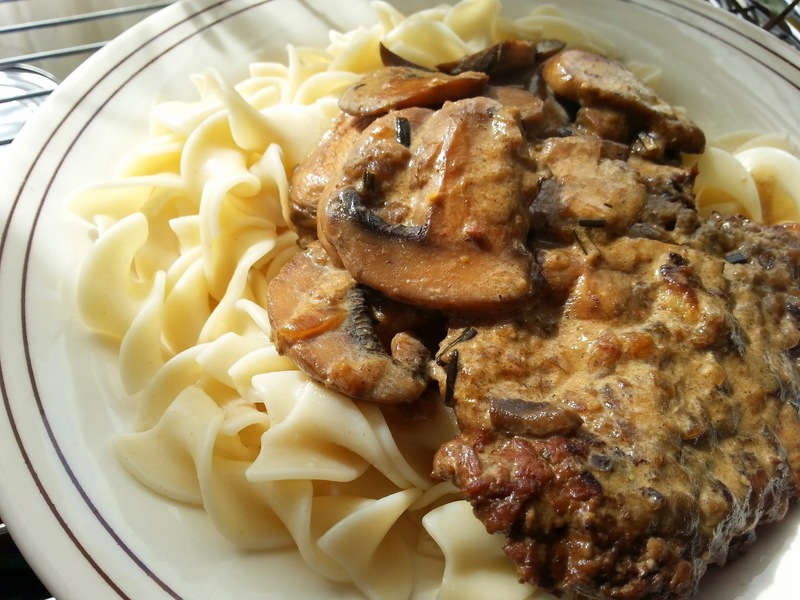 My darling husband asked me to make beef stroganoff. My first instinct was to run screaming from the house. I'm not a big fan of old-fashioned comfort foods. I also didn't really have the ingredients on hand. I used to go shopping like everyday and that has gotten really, really old and tiresome. So now I've decided to adapt recipes to ME! YEAH! We are also trying to eat less meat. One - the prices are really getting out of control. Two - too much meat is just not that healthy. Three - Ferdinand is not that healthy; his body does not digest meat very well. So, I had a great idea. 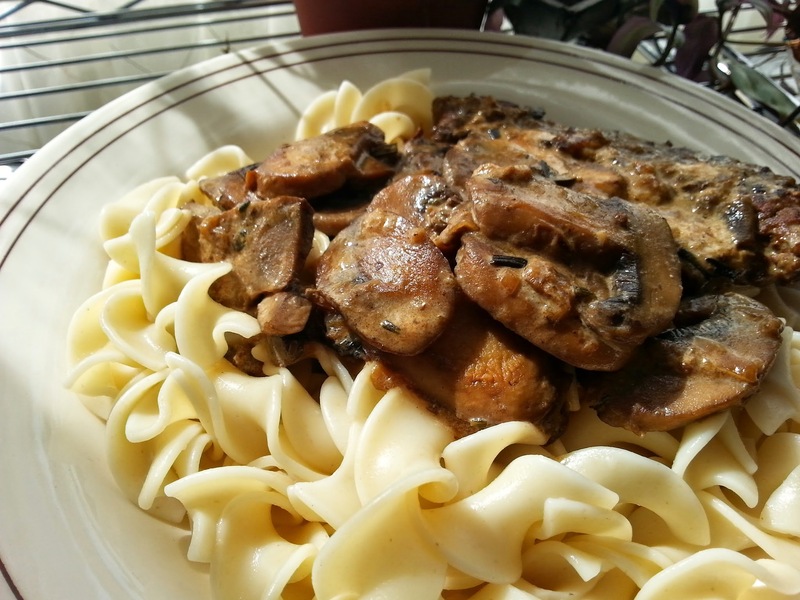 More mushrooms, less meat. Keep all the flavor. Heat oil in a Dutch oven over medium high heat. Season steaks with salt and pepper. Cube steak, in my neck of the woods, is very lean, so you may need a little more oil; you don't want anything sticking, but you do not want a lot of unneeded oil either. Brown steaks on both sides. Add onion and garlic and cook until the onions begins to soften and becomes translucent, about 5 minutes. Stir in the beef broth, cover, reduce heat, and simmer until the beef is fork tender, about 1 1/2 hours or so. I'm sorry, but nobody likes a tough cube steak. Nobody. Also, if it gets too dry, add water. And by dry, I mean dry. You will only want something in the neighborhood of a 1/2 cup of liquid at the end of cooking. Meanwhile, in a separate skillet, melt butter over medium heat. Add cayenne, rosemary, and mushrooms. Cook, stirring occasionally, until mushrooms are tender, about 10 minutes. Season with salt and pepper. Stir mushrooms into the steak mixture, then stir in the sour cream. Taste for seasoning and if needed add a tiny bit of water so you have some gravy. Normally, I ask my sweet husband (I am only partially being facetious) what he would like for dinner. I have started asking him the night before because invariably he picks some sort of annoyingly long cooking comfort food. I may be sounding like I do not much care for comfort food, but let me assure you you are right! I hate it! I get no comfort from comfort food. It's usually not-particularly-healthy food Grandma used to make because it was cheap. I'm as thrifty as the next guy, but I have bought into this fresh-food-for-foodies thing that we have going on. I prefer something simply grilled and served with lots of fresh veggies. I know; there is something wrong with me. Actually, if it were up to me, I would make whatever I wanted and he could take it or leave it. But then I remember that he is really quite ill and I want him to be happy. I also suggested that we sit down and plan meal like a week at a time. I used to have to shop every day, but I did put my foot down and now I refuse to do that. So, tonight (for tomorrow), I made a few suggestions and he said he wants none of what I've got. He wants Beef Stroganoff, Russian style. 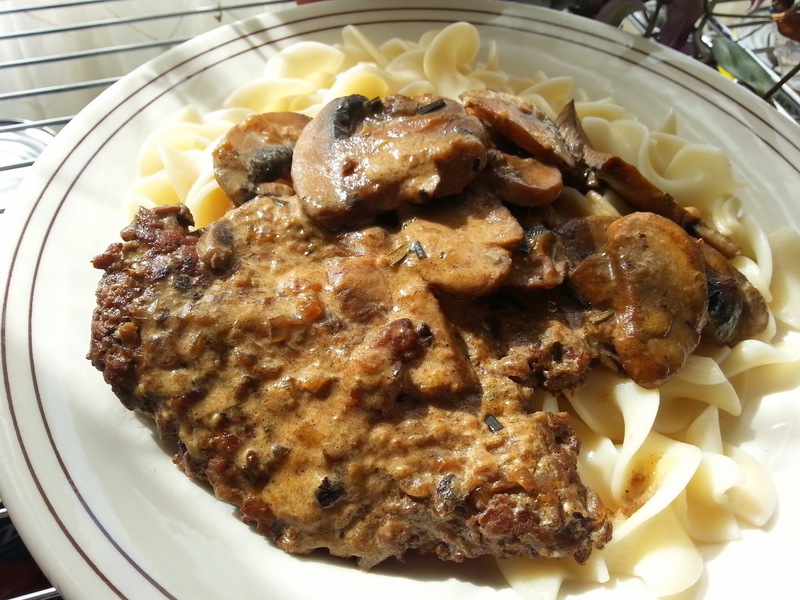 Now, I have made him Beef Stroganoff a few times and used so-called "authentic" recipes and he didn't really like them. I think this is one of those dishes that everyone has a different recipe. I have no idea what he thinks he wants, but I have cube steak and I am making Beef Stroganoff . I looked around ye olde internetus and found lots of recipes. Many of them were for the slow cooker, but I dropped mine (grrrr) so I skipped those. I found one that claimed to be so-and-so's mother-in-law's recipe, but I had to reject that one as well. Something about boiling beef that has not even been browned first, and then rinsing and tossing out the liquid just didn't set well with me. I suspect someone's granny was saving that boiling broth for another use to stretch the budget. I found one that used tarragon and mustard. Tarragon? No. Mustard? Maybe. Anyway, this brings me to the topic at hand. Some tips from me to you about herbs and spices. Fresh herbs are used towards the end of the cooking process; use dried if cooking for an extended time, meaning more than 15 minutes or so. I do like to start with dried herbs, then toss in some fresh during the last 15 minutes or as a garnish on a finished plate. Dry your own herbs because they taste much, much better than that stuff you get in jars. I like to grow herbs, but sometimes that is not practical. I have been known to purchase fresh herbs just to dry them to put in jars. You can dry herbs by tying the stems with string and hanging them upside down in a closet or something. I usually just lay them flat on a large plate overnight or sometimes two. When I put them in jars, I leave any leaves whole, then crush them when using to retain the most flavor. Dry herbs are more potent than fresh. It is about a 3:1 ratio. If your dry herbs are not fresh (no, I am not trying to be funny), I mean older, you may need to add more than what is called for in a recipe to get the desired flavor. If you think you do not like a particular herb use my patented four-trial-taste-plan (its not really patented). As an example: I did not like thyme. It was gross. Do people even still say "gross?" So, I would use less than what was called for in a recipe and gradually increase the amount in successive recipes that called for thyme. What I mean is I would make something using 1/4 of the amount of thyme listed. Next thing I made, I'd use 1/2 the amount listed, etc. Using just 1/4, I would think, "okay, not too bad but I still don't like it." Next recipe, "it's okay." Third time tastes pretty good. By the fourth time I used thyme, "I LOVE THYME! LETS PUT THYME IN EVERYTHING!" Same for cilantro. But for that, I also only added it at the end. Now, I prefer cilantro to parsley. Buy whole spices and grind them yourself. Once a spice is ground up, it begins to lose flavor. Whole spices last pretty much forever. To grind whole nutmeg, you can use a grater and just scratch it across the little holes. Other spices need a mechanical spice grinder, mortar and pestle, or a dedicated coffee grinder (one you do not use for coffee, just for spices). Some purists will tell you to toss ground spices that are more than 6 months old. I will not. If I think a spice has lost some of its pungency, I'll just add a pinch more. Waste not; want not. Buy the best quality that you can afford. Before I knew how to cook, I used to buy spices in the equivalent of a dollar store. Now I buy actual name brand spices sometimes and they are so much better in taste and color. I'm not really going to be able to write something every day, so don't get all happy. I'm just getting my feet wet, as they say. They say a lot of things, don't they? Funny that I say I am getting my feet wet because I do maintain another blog. It is mostly just recipes - not much writing. Not that I am writing, this is more like sharing thoughts, but you get the gist. So, I am currently training my husband to be a normal human being. He, of course, thinks he already is a normal human being. I beg to differ. Yesterday, he actually called me at work to tell me he liked his dinner (its working!). So much so, that he wanted to be sure I saved the recipe (me? save a recipe?). I did, but it did not have any cumin in it. So, instead, I'll present you with one of our favorite dishes. It is a Cuban dish. It's also relatively inexpensive because it is made with cube steak. I know, I know. Trust me, this is a good way to make cube steak. I have a photo, but have not posted it yet. Cube steak is marinated in a garlicky citrus-lime sauce for a short time, then quickly braised. Serve with boiled potato and choice of vegetable, if desired. Smash and peel garlic and place in a mortar; sprinkle with salt and let sit for 5 minutes to soften the garlic. Use the pestle to form the garlic and salt to a paste; in a small bowl, combine the garlic paste, oregano, cumin, pepper, lime juice and orange juice. Place the steaks in a single layer in a baking dish; pour the marinade over and let sit about 20 minutes. Heat a skillet over high heat, add oil, and cook the onions and peppers, while stirring, until softened, about 2 minutes; remove to a bowl. Place steaks into the skillet and cook for 2 minutes, then flip and cook another 2 minutes. You will probably have to do this in two batches. Return the onions and peppers, along with the steaks, to the skillet, cover, and cook another minute. Place steaks on a serving plate covered with the onions and peppers. If desired, you can cook the marinade for a couple of minutes and spoon that over the steaks. Not that I want this entire thing to be about cumin, but I did read up on the history of cumin using the Internet. After a while I started to get a little bit annoyed that every page said just about the same thing. Its like there is no original content; everyone is just copying everyone else and posting the same things over and over on the Internet. Really? It's like the grocery store. Instead of the shelves being stocked with lots of different things, there are five and six different brands of the same thing. I know people swear one brand of tomatoes are far superior to another, but I'll let you in on a secret, mi amiga, the best tomatoes do not come in a can! I won't bore you with the stuff you can read on any page, but just drop off a few interesting cumin-ology. Cumin is from the Apiaceae family of aromatic plants with hollow stems. Other family members include: parsley, dill, carrots, parsnips, fennel, caraway. Some regions of the world do not really differentiate all that well between cumin and caraway. It is also called Roman caraway and, likewise, caraway is called Persian cumin. Fennel (anise) is sometimes called sweet cumin. Cumin is considered to be a major spice in Indian cuisine, as well as North African, Middle Eastern, western Chinese, and Mexican cuisines. Actually, it is really only used in the northern parts of Mexico and only sparingly. It is more widely used further south like in Colombia. Not really. My husband is Colombian and he insists that everything has cumin in it. Here comes our first cumin recipe. Well not a recipe for cumin, but rather, one that contains cumin. Heat a non-stick skillet over low heat. Break the eggs into a bowl and scramble vigorously with a fork. You'll get better action with a dinner fork; the one with the long tines. Add a little water, no more than a tablespoon, and continue to scramble until the eggs get a little frothy. You can either season the eggs in the bowl or after you add them to the skillet. Melt the butter in the skillet, then pour in the eggs. Use your fork to move the eggs around as the cook. They are technically done while they still look a little wet, but they continue to cook after being plated. I wish I could tell you why it is so hard to discover my cooking identity, but I really have no clue. I used to have no clue in the kitchen either, but I've been practicing. A lot. I raised four children, but I have no idea what I fed them. I vaguely recall making chicken nuggets with a beer batter mix meant for fish. The kids loved it. I also remember one of my sons telling me to get adobo seasoning because his friend's mother used that. I put that sh*t on everything. Now I have morphed into some sort of food snob, but I still try to eat healthy.